neoprene iron cover 10 PCS Neoprene Golf Club Iron Cover Set. Best protection available for your expensive golf irons. Fit the most widely used irons in golf . . Designed to fit your clubs and protect them from the dings and damage that occur during play or travel. Made of neoprene Machine washable. 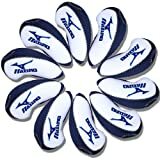 This entry was posted in Golf and tagged 10Pcs/Set, Blue, Covers, Golf, Head, Iron, Mizuno, MT/Mz02, White by FPSports. Bookmark the permalink.